The concert will be the choir’s last under the baton of Dr. Kenneth J. Nafziger, who retires this spring after 39 years as a member of EMU’s music faculty. For it, Nafziger has purposely sought out musicians in Central Virginia and the Shenandoah Valley who can augment the more traditional selection of material offered in previous years. Kenneth J. Nafziger after leading a Chamber Singers reunion choir during a Homecoming and Family Weekend. 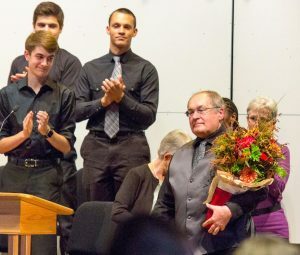 The result is a highly eclectic program that employs the talents of a wide variety of performers with connections to EMU’s Music Department, and to the Chamber Singers – past and present. Among them are several EMU graduates, as well as current and former colleagues of Nafziger’s ranging from David McCormick, founder of the Charlottesville-based baroque ensemble Three Notch’d Road and newly named executive director of the Shenandoah Valley Bach Festival, to Trent Wagler ᾽02, who fronts Steel Wheels, the nationally celebrated roots band. Jeanette Zyko, who instructs in oboe at James Madison University’s School of Music and serves as the school’s director of undergraduate admissions. The concert begins with a processional piece borrowed from an African-American church in Washington, D.C. It will be followed by a Bach cantata, with strings and oboes. The concert’s concluding segment is titled “Great Prayers,” and features settings of prayers attributed to Jesus, St. Augustine of Hippo, and St. Francis of Assisi. Admission to the concert is free. However, any donations received will go to support the EMU Music Department’s scholarship fund. Nafziger – who has earned renown not only for his choral and orchestral conducting, but also for his central role in the founding of the Shenandoah Valley Bach Festival – will continue as the festival’s artistic director and principal conductor for its forthcoming 25th anniversary season. The festival runs June 11 through 18 at EMU and other venues in and around Harrisonburg. I am looking forward to this concert. I was privileged to sing under Ken the 1st year he was at EMC/U and for next 3 years. Highlight was production of St. Matthew’s Passion by Bach. Will Never forget Requiem/Mozart in Shen. Choral society. DNR said tenor section was “electric”–was so proud to be a part of it. I wouldn’t miss this for anything. And I won’t – because I can watch it in the middle of being on vacation! I’m doing double duty on this one as I only saw the picture before I had responded to my sister in law Jane Moll’s forwarding of this notice of Dr. Ken’s final EMU Chamber Choir concert tomorrow evening. It’s 630 a.m. Saturday the 22nd here in Indonesia. I celebrate with all of you, especially with Dr. Nafziger and his wife Helen, who pulled this cornfield dairy-land farm boy into his Choir and allowed me to sing bass/ baritone from my first quarter of college, alongside Gene Gjerdingen and Dave Gandrud, at the University of Minnesota, Morris through my senior year. Here’s what I had written, and I since I never repeat myself, I’ll let it be what it was on FaceBook. It’s not that I don’t want to repeat it; it’s just that given my chasing the tangentials the way I do, (they didn’t diagnose that in the previous millenium!) it’s hard to plow a straight furrow when the horses are acting like they’re Lippezzaner stallions rather than a great old Virginia ploughman’s dream. ***** Thank you for sending this my way, Jane Cottrell Jane Moll. Can’t be possible, can it? They’re just a bunch of “KIDS?” How can 47-43 years ago have gone by so quickly since the afternoon weekday hours when we were singing for him at the University of Minnesota, Morris. I hope each of these beautiful young people know what kind of gift, indeed a rare privilege, they have been given by God to have had Dr. Ken’s presence in their tutelary vocal-AGE. If they don’t grasp that now, they will in the future. We were in the near beginnings of a wonderful man’s and his wife Helen’s full lifetime of investing in others to demonstrate how powerful is the carrying-through effect not just of his competence, but of the rigorous demands of Dr. Nafziger’s content borne within his instruction as he brought a depth of exposure to and experience with significant choral music that stood the test of time because a professor we knew lived up to the discipline and elegance required to perform these challenging works. You can see I really needed an undergrad major in English rather than Chemistry! Remember Dr. Spring’s accompanying us as the narrator of Dr. Ken Nafziger’s personally written commentary during those concerts? They were worth the evening well spent even if a single note had not been sung. It was like listening to someone’s yearning soul describe the connection between the rain and the rainbow and the ocean and the rivers that flow from the mountains connected to the Sea, the Great Sea of human achievement that stands or rather kneels in awe of God. Sorry we’ll miss your swan song musicale, Ken (shouldn’t note publicly that it’s becuz we’re at a line dance workshop all this weekend in Parkersburg, WV). 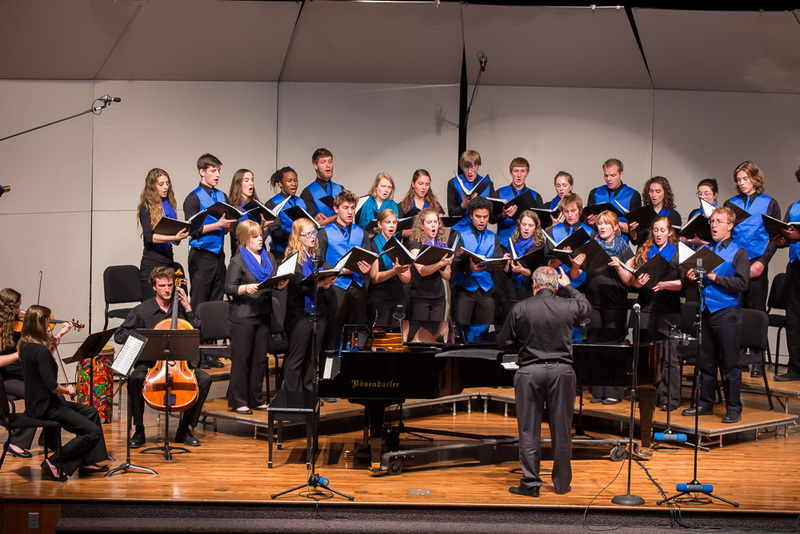 Thirty-nine years of wondrous music at EMU – wow! – you can and should be (humbly) proud. I beat you by one year on staff – the biblical 4-0. But the hills (and purple mountains of the Shenandoah) haven’t heard the last of you, I’ll wager, what with the Shenandoah Valley Bach Festival and other such melodious accords. Enjoy every note-worthy moment! I hope it will be available not just live stream, but recorded. I’m so sorry to not hear it live. Thanks, Ken. You also did so much for the church with Hymnal: A Worship book, songbooks, recordings, and Laurelville. A wonderful legacy.